Here is a simple little HF TX. It may be modified for all the HF bands, but the details given are only for the 7MHz band. The basic transmitter uses two transistors BC547 and will deliver over 250mW of power. 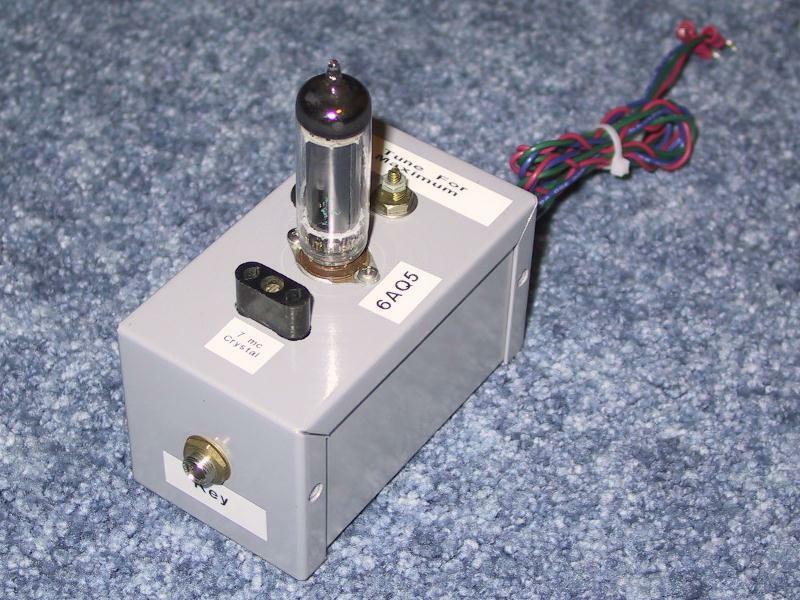 Below is a photo of a simple 40 meter CW transmitter that I built. It sports full break-in operation and 250 mW of output power. The final output transistor is a mighty 2N2219A. This cute little 40 meter CW transmitter is nothing more than a 6AQ5 oscillator coupled to the antenna. Power output is on the order of 6 Watts with 275 VDC on the plate and a crystal with good activity. 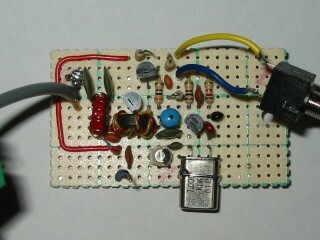 This is a VFO control, easy to build 7 watts QRP on 7 Mhz from Vasantha VU2VWN. 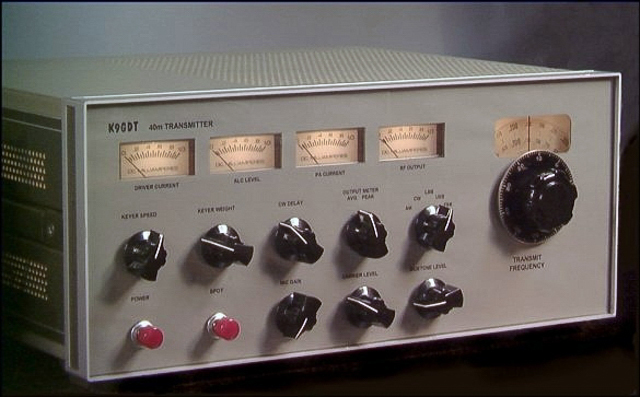 If you are in close VU, you may hear hundreds of hams using this QRP on 7MHz - AM. I will show you my first full handmade transmitter. This is three stage CW transmitter for 7MHz. I ordered the crystal for the crystal's maker. The signal made by the oscillator is amplified by the two stage C class amplifier. In 2005, I had built a transmitter featuring pre-mix VFO unit using ceramic resonator VXO. Since the VFO stability was not enough for field operation and collector efficiency at the final stage was so poor, I decided to build another configuration. A couple of days ago I built a simple 2 transistor transmitter on a small piece of PCB material. I used the style of construction that seems to be becoming my default – Manhattan-style using MeSQUARES from QRPMe. The circuit of AM transmitter is designed to transmit (amplitude modulated) DSB (double side band) signals. A modulated AM signal consists of a carrier and two symetrically spaced side bands. There is nothing more satisfying about this hobby than building your own transmitter. The circuit in figure 1 is a crystal controlled CW transmitter with at least 5 watts of power. Ham radio lost its kick? 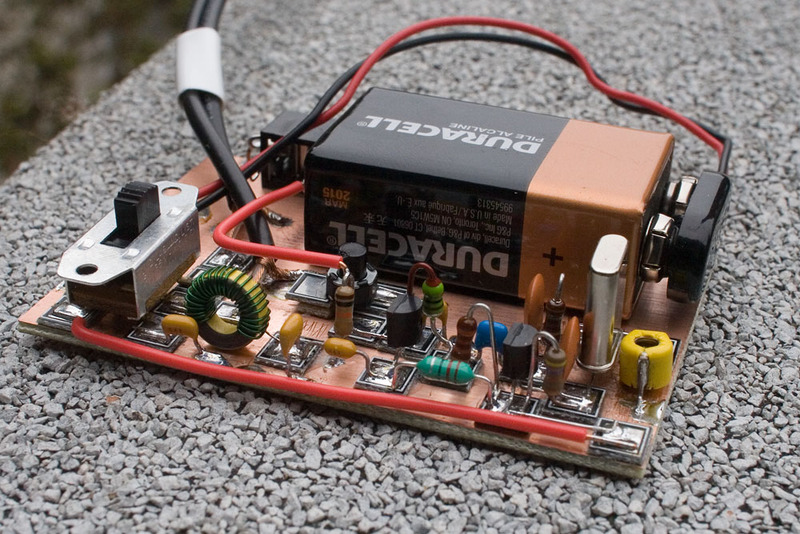 Go QRP with this weekendproject transmitter! WAS with a 40-meter half-watter? In May 1976, QST printed an article that would become legendary! "THE TUNA TIN II" by Doug Demaw (W1CER) was an instant hit. Over the next few months and years, hundreds of Tuna Tin II's were built and put into operation and many hams were introduced to the challenge of QRP for the first time. 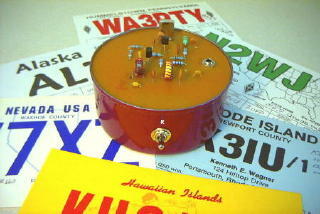 The Tuna Tin 2 tiny transmitter, designed by Doug DeMaw, W1FB, was first appeared in May 1976 issue of QST magazine. This is a Japanese modification. Instead of 2N2222A, Toshiba 2SC1959 and 2SC2120, are employed. In the CANARINHO simple version we have only the TX, keyed directly by the CW key. Building it this way we have a current of about 180mA in the key, but it is no good because it burns the key contacts in little use time. After the CANARINHO success we decided to build a transmitter with the lowest number of discrete parts. So we arrived to the CURRUIRA. There are only 7 parts! 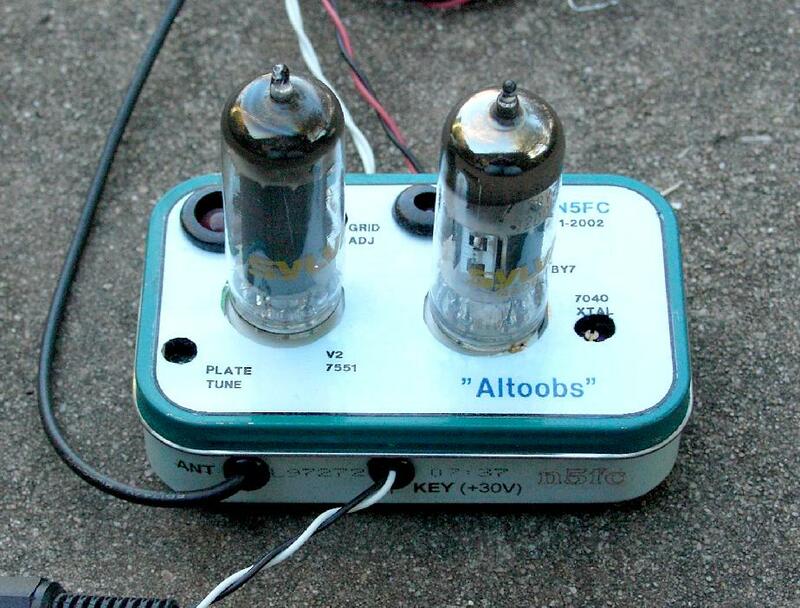 It is a crystal Colpitts oscillator with almost all deleted! Because the high interest raised by the DSB projects, we decided to publish a circuit we have mounted and worked very well, in spite of it has no box yet and haven’t been practically tested, as everything we publish here was duly tested in the home-brewing shop and in QSOs. The JORF is a simple transmitter with 4 stages, it works with a ceramic resonator VXO, common transistors (2N3904 or BC547 or BC548 and the BD139) and commercial inductors. 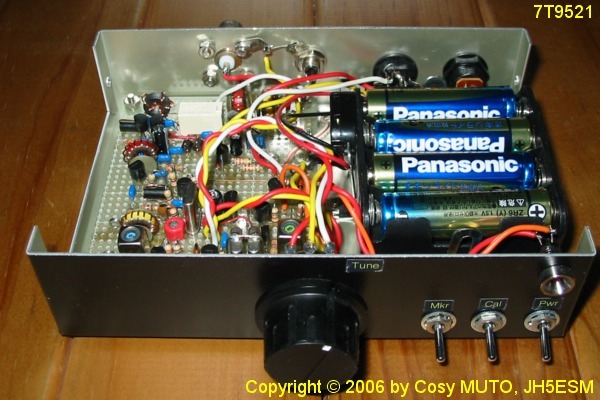 JUMA-TX1 is a CW transmitter for 80 m and 40 m amateur radio bands. It is a follow-up project to the JUMA-RX1 HF receiver. The VFO is using DDS and the output power is 5 watts. This ultra-low power QRSS beacon was designed to be as efficient as possible, and produce a milliwatt or few from low voltage, low current supply. Vamos desenhar um transmissor de CW ! Basically, it is a conventional Colpitt type crystal oscillator but with the output taken from a low value collector load resistor and direct coupling is made into the base of the PNP device used as an amplifier. This is AM transmitter, using no power supply. It moves only by the voice power. Audio power is translated for electric power and it excite radio frequency oscillator. Aqui mais um transmissor de CW, simplificamos o SOVINA ... retirei o 7805 e o 74HC02 ...substitui por um 2N7000 que funciona como oscilador a cristal e driver.